If you live in Israel, then chances are you have a bottle (or three) of arak lying around. And, if you’re like me, you don’t reach for it all that often. Similar to other anise-flavored spirits like Greek ouzo, French pastis, Turkish raki and Italian sambucco, arak is often consumed in shot form or sipped as an aperitif. It gets its nickname, the Milk of Lions, because a splash of water turns the liquid from clear to milky white and mellows the flavor slightly. (To read more about the history, distillation process, and cocktail recipes check out my article on the subject in the Jew and the Carrot). I’ve often thought about cooking with arak, but had yet to find the right application. Recently, I ordered mussels at local restaurant Aquarius, mostly because it wasn’t something I’d seen ’round these parts. They were nicely cooked in a fragrant sauce perfumed with pernod, which is a classic French preparation. I wondered why the chef hadn’t substituted the very similar (and cheaper) local arak, and filed that idea away in my brain. When I saw frozen mussels in Tiv Tam I was excited. 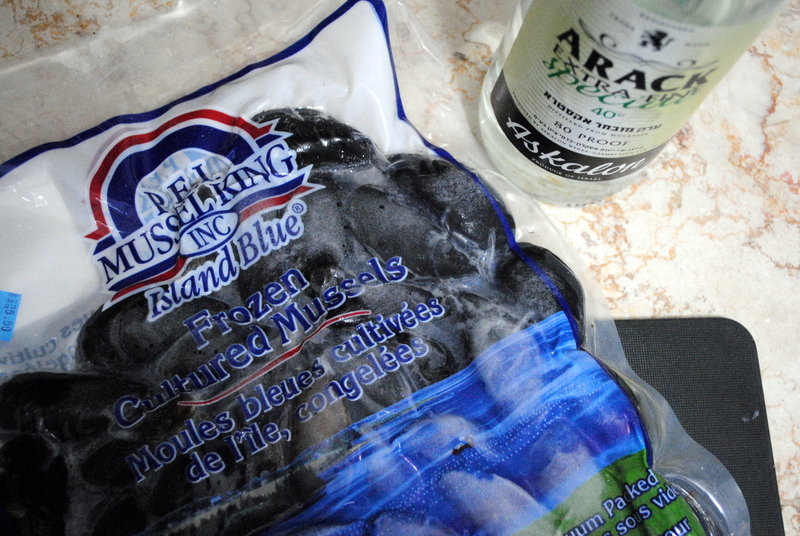 Then I noticed that they were PEI – Prince Edward Island – mussels imported from Canada, and I was through the moon. Most of the seafood we get in Be’er Sheva is from Thailand, but here was some serious (traif) seafood. As soon as I picked up the bag of mussels I knew I would cook them in arak. And so this recipe was born. It turned out beautifully. 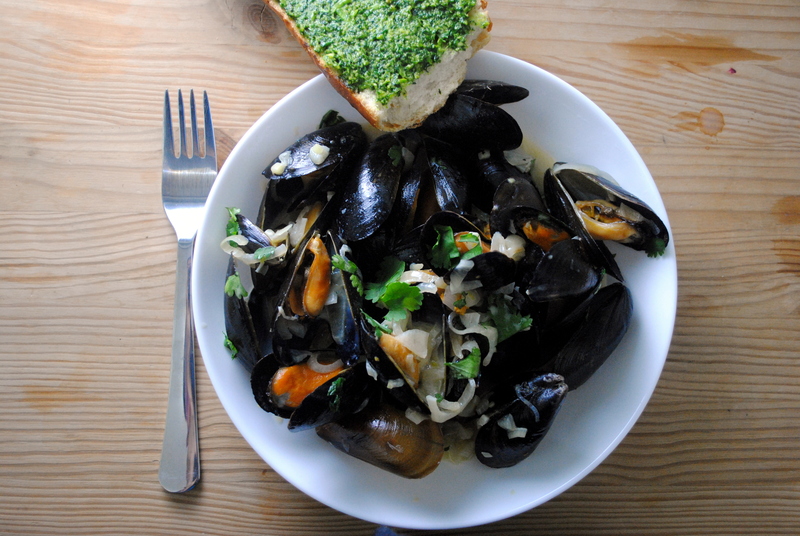 As much as I love mussels, my favorite part is usually sopping up the sauce afterward with some bread (preferably slathered in cilantro pesto, a combination I was introduced to at August restaurant in New York). This recipe creates a sop-worthy sauce that you’ll be licking out of the bowl if you run out of bread. If you don’t like arak, never fear – the flavor totally mellows, leaving behind only the slightest hint of anise. Saute the shallots and garlic in oil until soft. Add the wine and arak and cook over high heat until reduced slightly. Add the mussels (if frozen you can put them in right out of the freezer). Stir, cover, and cook over high heat for just a few minutes, until shells open. 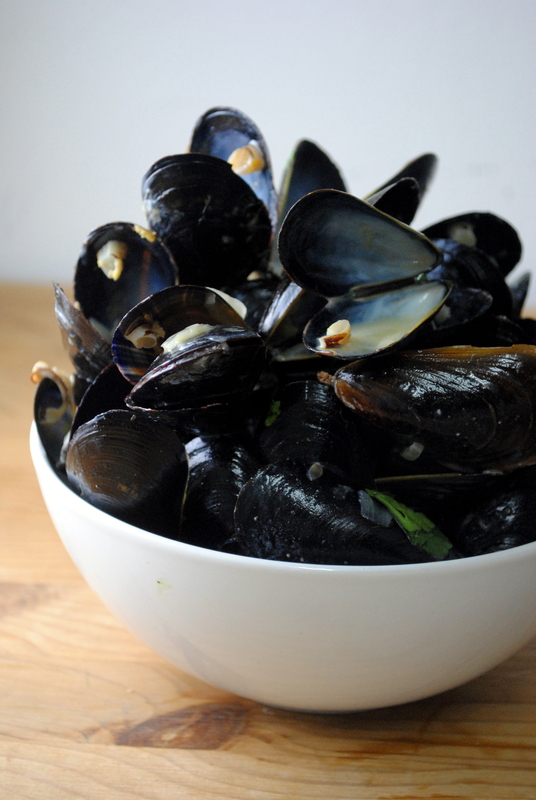 Using a slotted spoon, remove the mussels and set them aside in a large bowl. Add the cream to the pot with the rest of the liquid and simmer until reduced by half. Season with salt and pepper. 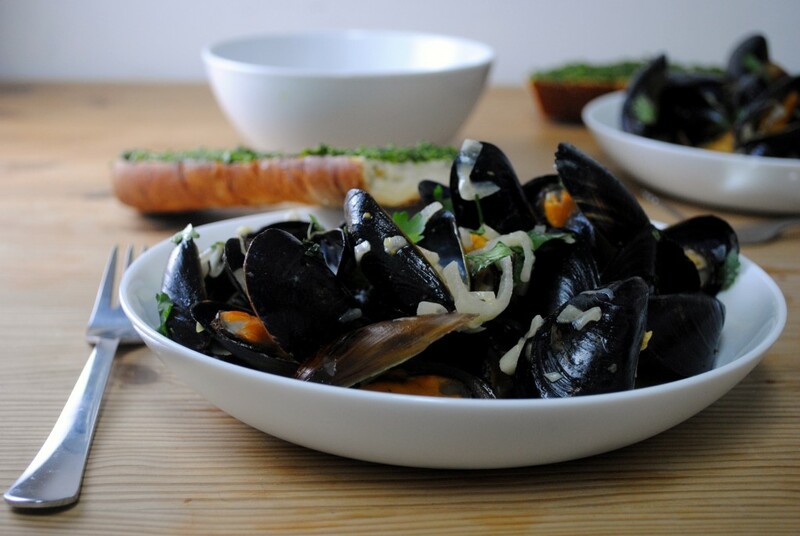 Add the mussels back in and throw in the fresh cilantro. Toss to combine and serve with lots of toasted bread (preferably spread with cilantro pesto) to soak up the sauce. Thank you tasteofbeirut! I couldn’t agree more.